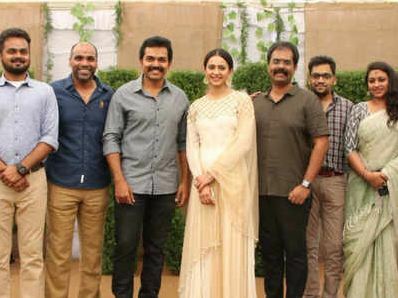 After Khakhi (Theeran Adhigaram Ondru), Karthi and Rakul Preet Singh have teamed up once again for a new movie. Titled Dev, the film is being helmed by debutant Rajat Ravishankar. As per the latest update, the film’s team along with Karthi and Rakul Preet flew to Ukraine to shoot crucial episodes. Dev is billed to be a romantic entertainer. It will also feature Karthik, Prakash Raj, Ramya Krishnan, Amrudha, Vignesh, Vamsi, Ravi and others. Harris Jayaraj is scoring music for the film planned for release on Dec 21st. Meanwhile, Karthi is enjoying the success of ‘Kadai Kutty Singam’ (Chinna Babu).